We began our weekend ride at Little Llangothlin Nature Reserve, high in the granite country outside Guyra on the Northern Tablelands of NSW. The reserve protects Ramsar-listed Little Llangothlin Lagoon which is one of the few remaining high altitude freshwater lagoons on the New England Tableland, sitting at 1360m above sea level. It provides refuge for over 100 species of birds but in the aching cold of a winter afternoon we saw little more than a cowed handful of black swans and a flock of coots searching the muddy bank for food. 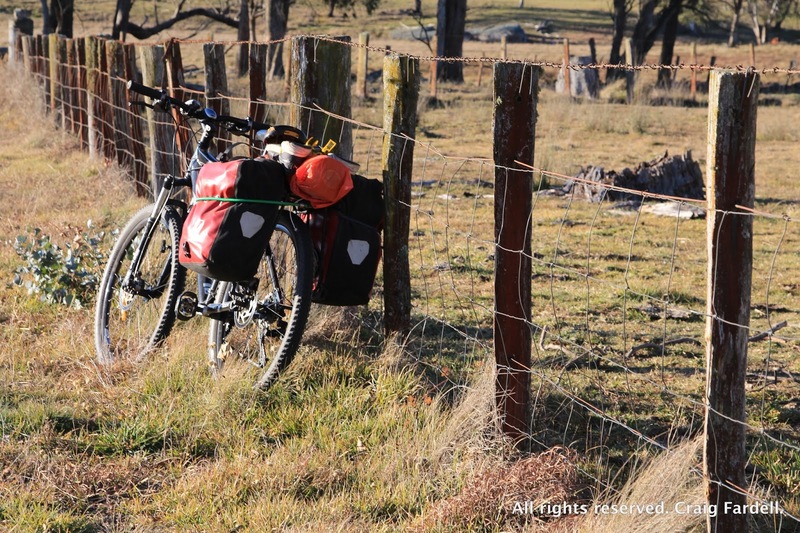 We set off at 2pm on a Friday with full panniers loaded with camping gear and food enough for two nights out on the backroads and dirt tracks of the tableland. 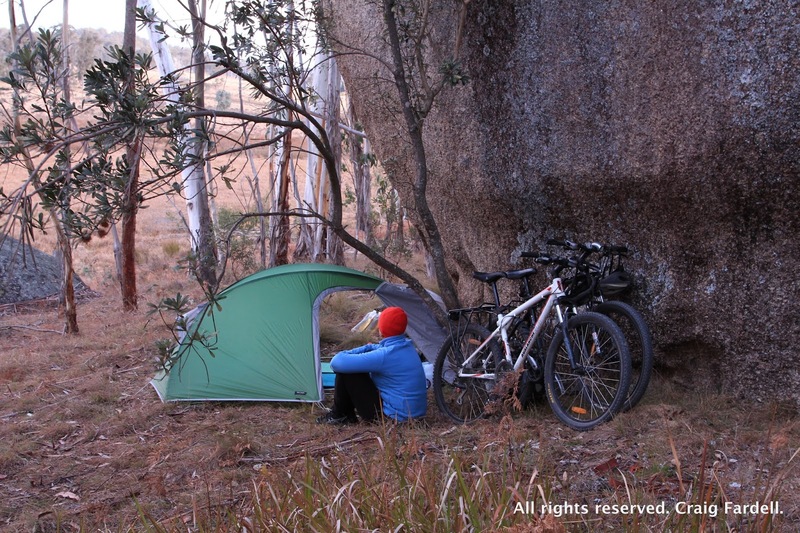 Our only real objective for the trip was to rediscover the joys of cycle touring, get some fresh country air and exercise, and at the same time, get a good look at a peak called Crown Mountain, tucked away in a small, obscure national park and rumoured to be a spectacular rocky outcrop. We'd heard about Crown Mountain but never seen it due to its location, in the middle of farmland a long way from any major roads or towns. 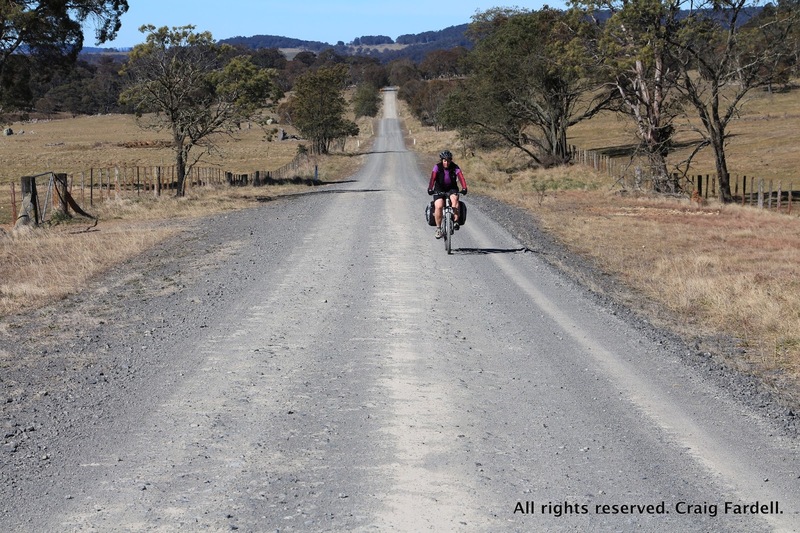 Cycling away from Little Llangothlin the wonderful intimacies of bike touring immediately welcomed us - busting up flocks of yellow-rumped thornbills in the grass beside the road, hearing the stuttered whistling of a nankeen kestrel in a dead tree to the left. Cows in a paddock went berserk as we passed; racing off in panic, dodging and weaving in a crazy line until the whole herd stampeded toward the hills. We followed empty roads east then north. All the properties and farm houses we passed boasted amazing back yards and top paddocks - filled with stones and jumbled hills of rock that would be bouldering heaven. We took a back road to Backwater - 8km of narrow bitumen winding across the undulating ridge tops and towards Peter's Hill. Backwater is nothing more than a locality on a map, but it does have a pretty church and an extraordinary tiny museum that is left open at all times for passing visitors. The museum is located in the old town post office and its walls are plastered with newspaper cuttings and stories of local families, gold rushes, natural disasters and the history of the museum itself. From Backwater we rode straight ahead and began climbing out of the valley to a property called Wattleridge, which is an Aboriginal Protected Area. From high up on this road we got our first views of Crown Mountain (elev. 1370m) at the heart of the little known Warra National Park. Our plan is to one day return and climb Crown Mountain but for the moment we were thrilled to see its distant, bare rocky crown jutting out of the surrounding forest, painted orange by the late evening light. Behind it was Mt Nightcap (elev. 1372m), and straight ahead was the looming dome of Mt Mitchell, which is outside the National Park and higher again at 1476m. From Wattleridge, I expected the road to give us a big roll off the other side down to the Sara River; marked on our map and where we hoped to camp. Instead we got a small drop to something signposted as the Mitchell River – a narrow, cattle trashed trickle of water through open grass paddocks. We were forced to fill up our water bottles here but camping was out of the question as it was clearly private property. We ended up finding a quiet grassy spot amongst the roadside trees near our next turnoff, after completing 35km for the afternoon. Despite feeling pretty weary, and despite the less than spectacular campsite, we went to bed happy, still smiling and looking forward to the 12 hours of darkness rugged up in our down sleeping bags. 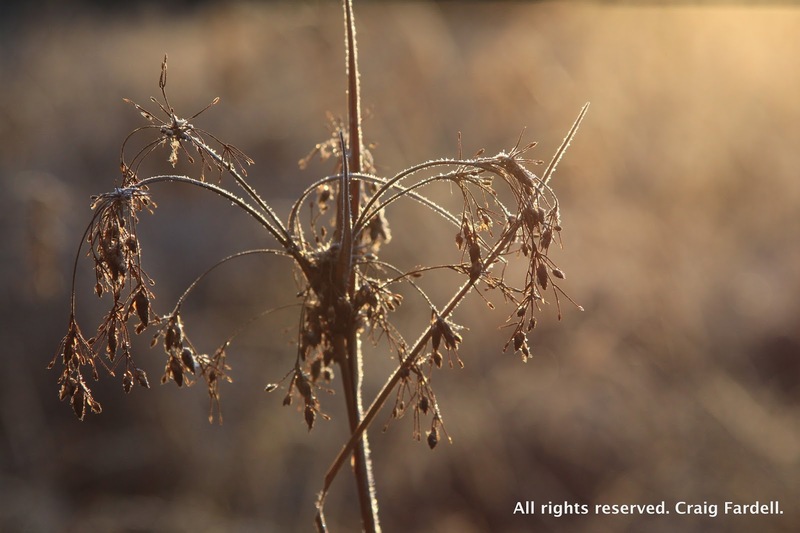 In the morning we woke to a light frost in the paddocks and the silence of frozen air. Then, as the sun rose, the magpies for kilometres around began singing in such numbers and so loudly their warbling was overwhelming. The magpies were soon joined by wattlebirds, rosellas and thornbills and finally the kookaburras and cows. The noise was amazing: the world filled with a chorus of clear sounds and the language of animals. It was a wonderful waking – life as a song. 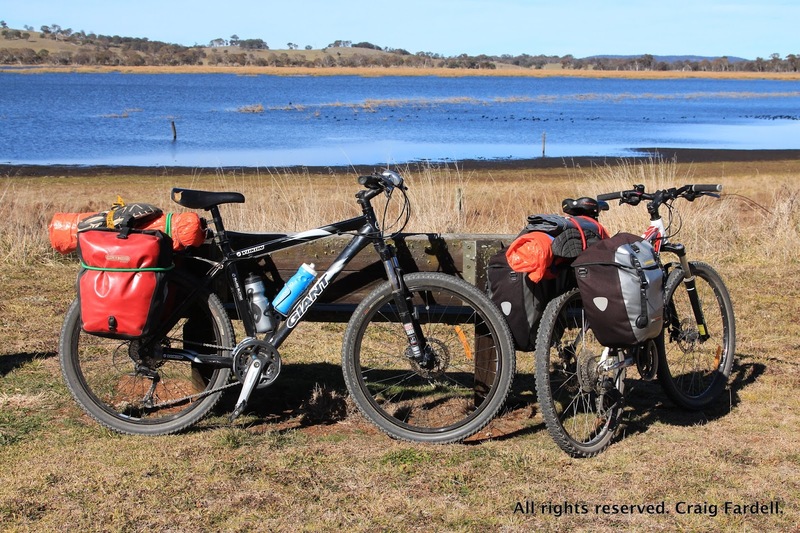 Once packed up, we wheeled the bikes to the road then turned right onto Aqua Park Road and then left onto the Mt Slow Road so we could circumnavigate Warra National Park and its centrepiece, Crown Mountain. 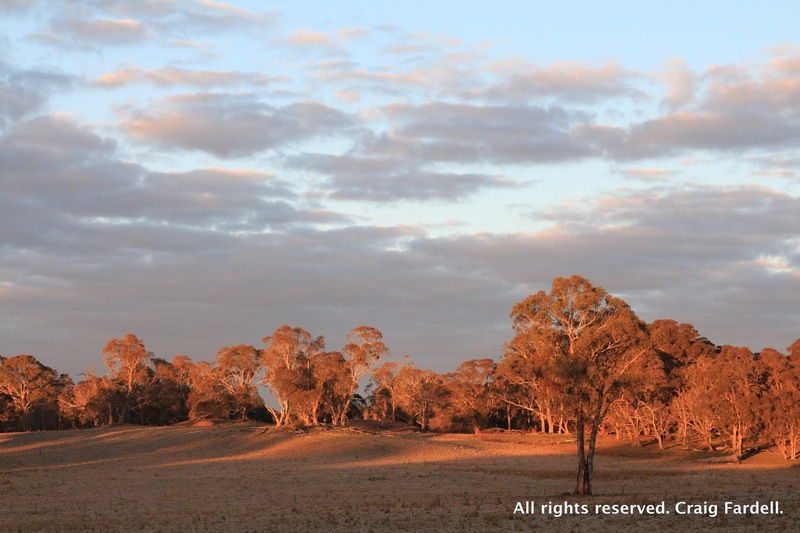 According to our maps and the NPWS online information there appears to be no road through the national park because of surrounding private property. Rather than ride in and out the same way, we thought we'd go all the way round and make a loop of things. We were enjoying the empty, simple dirt roads and were joined at one point by a thundering noise to our right that turned out to be a beautiful horse bolting from the trees and galloping along the fenceline beside us. It was going flat strap and we couldn't match its pace. The dirt roads overall were extremely good, covered in sheep poo at one point as we cycled through and past a flock of woolies grazing the road verge. There was little or no traffic, some ups and downs, patches that were rocky and others that were thick sand so at times I was veering all over the road like a drunk. Water was a bit of a concern as although the big rivers were marked on the map (the Henry and the Sara) we were high in their catchment, in a drought year and there was so much farmland the rivers had little water in them. Moggs Swamp proved to have the cleanest, best water of the trip. We stopped here beside the road, pulled out the pot and stove and boiled ourselves up a cup of soup and then a tea and coffee – much to the bemusement of the few locals that drove past and gawped openly at us sitting on the bare grass beside the road, gear strewn everywhere. Perhaps the biggest issue with high country cycling is the strong winds that sweep across the open tablelands. That afternoon we copped the full force of a strong sou'wester, as we veered past Kookabookra to head back towards Backwater. Fortunately, like all good 'tour' riders I had my workhorse, Caz, out the front doing the hard yards while I drafted behind him. As we headed into the wind we could also see straight ahead to the eastern face of Crown Mountain. From this angle the mountain was a hump of dark forest, unlike its spectacular western rock face seen yesterday. 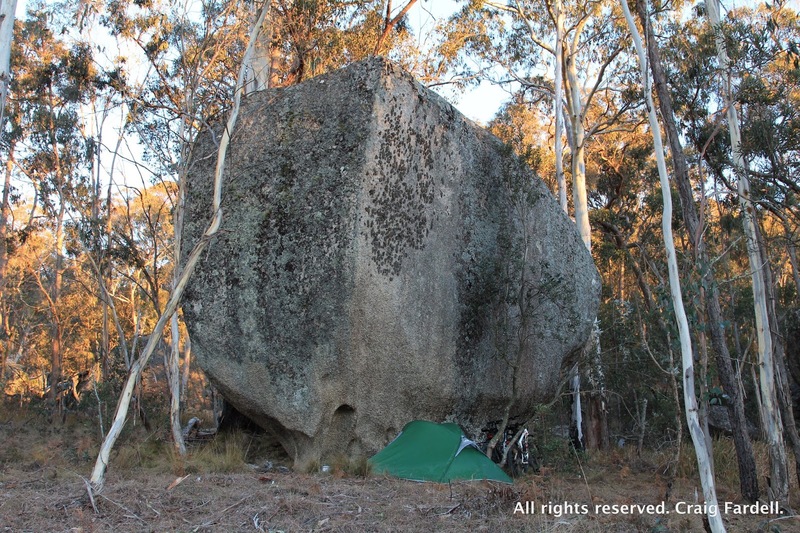 We passed Haystack Rocks on our left, scared up dark shaggy Euros from the paddocks, and rested beside one amazingly huge boulder sitting by itself on the edge of a paddock. 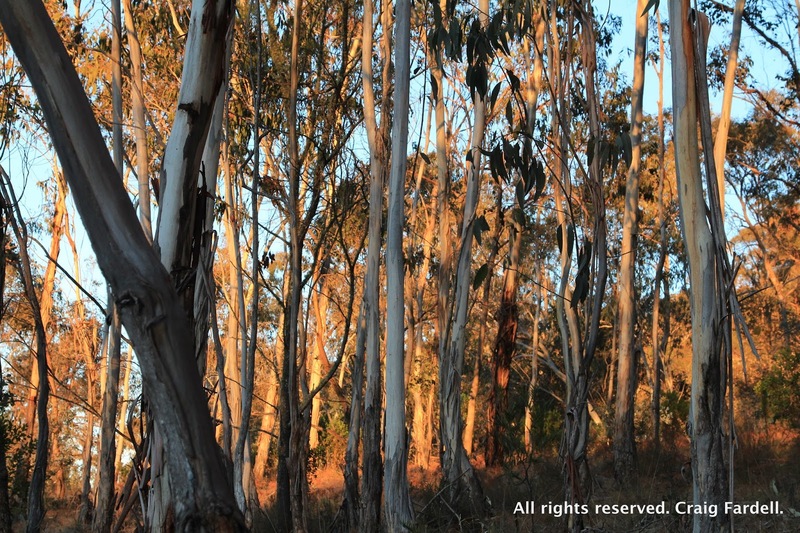 At Paddy's Gully swamp we found a lovely campsite, tucked off the road, under the protection of a tall boulder and we enjoyed a restful afternoon watching the yellow robins, thornbills, parrots and wallabies as they moved through the rocks and trees. Our total for the day's riding was just 47km but the corrugations, the soft dirt roads and the wind made it feel a lot more. Our biggest test on the final day was the biting cold. We woke to a heavy frost on the swamp and our tent turned to ice. By 11:30am we had looped back to Backwater and there was still frost on the ground. The wind was sharp and bitterly cold although fortunately not strong. The high forested country we had passed through beneath Crown Mountain was shady and cold and filled with the prints and tracks of wallabies and euros. Finally, for the last 15km, we began riding over the roads we had started on, heading back to the car and the lagoon. This time it was an ironic smile on my face. I shouted to Caz that it was no wonder I had enjoyed the outward journey – it had been all downhill. Now, I was forced to drop down to my lowest gears for one steep, rocky climb, and then cog back again for a long, slow ascent that stretched away before me. Again and again heading back to Little Llangothlin Lagoon we found ourselves climbing and climbing. The one downhill we enjoyed had us pushing into a headwind which nearly negated the benefit of the roll off. 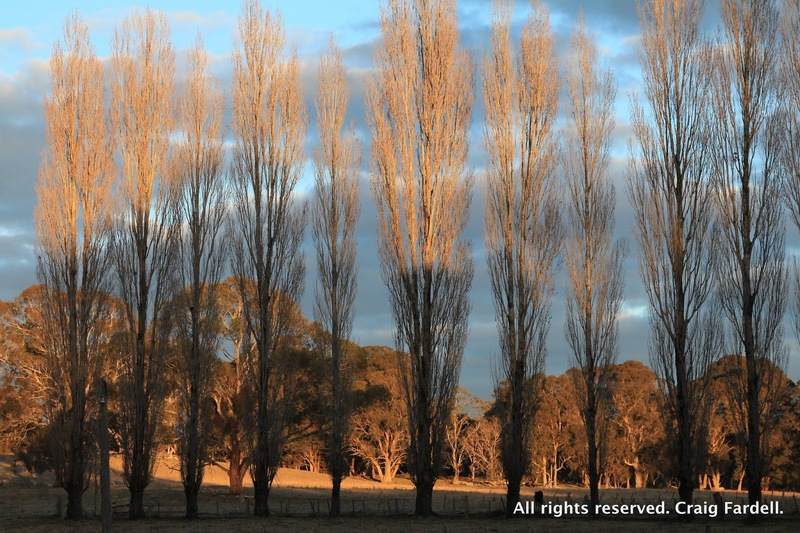 It was bitterly cold – nearby Guyra reached a maximum of just 6.5 degrees Celsius that day – but the last road to the lagoon put the wind on our tails again. We sailed along, still smiling, another 35km under our belts for the day and our love of cycle touring frozen once again into our bones. 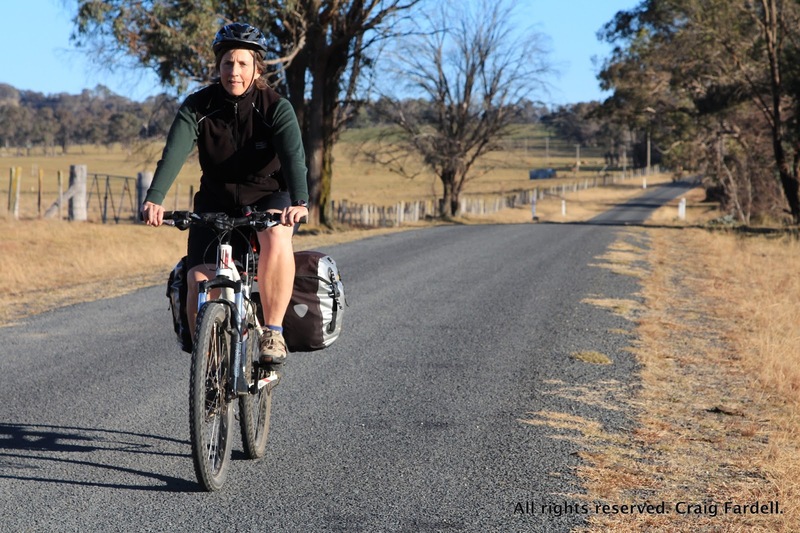 For some local cycle touring blogging we visit http://thenorrisfiles.blogspot.com.au. Nice read guys. Love riding the tablelands! Thanks for the shout-out too. Hope the injury clears up soon Christina. Good account of your interesting cycle ride, although I don't know how you managed to avoid freezing to death! 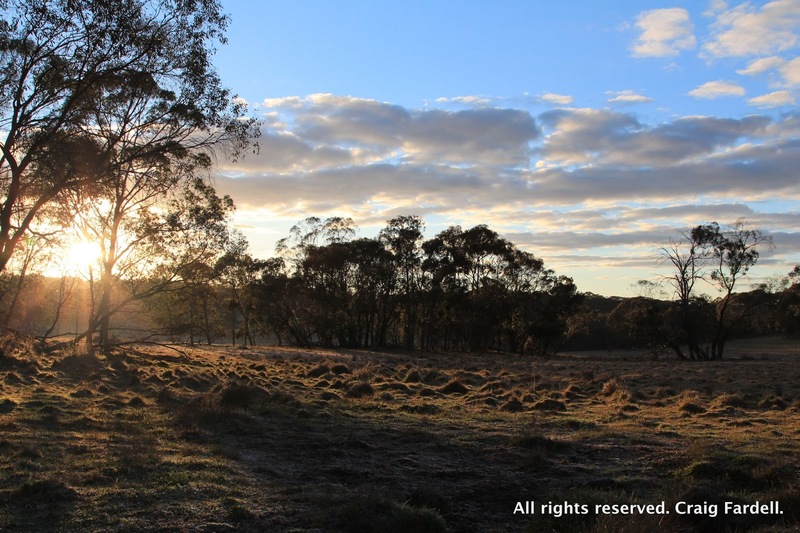 The Northern Tablelands weather is very harsh in winter.